Lots of things make you think of spring: flowers blooming, rain clouds moving across the sky, and - of course - spring cleaning. Spring cleaning is about more than opening windows, wiping counters, and sweeping off porches. It’s about giving your home and yourself a new lease on life as the new season begins. One way to accomplish that is by taking some time to accomplish organization projects. When your home feels clean and tidy, you’ll feel like you’re ready to tackle the season. Check out four of our favorite clutter-reducing spring organization projects below. Marie Kondo is a legendary professional organizer who brought the "art of tidying" to the mainstream. Her famous “KonMari” method of home organization has a few main tenets. First, tidy things all at once; don't just do it a little at time. If you're going to organize, commit. Next, visualize how you want things to look and how to get there. The next step is the one that made KonMari iconic. As you’re organizing, pick up each item you own. Look at whatever you’re holding and ask, "Does this bring me joy?" If it does, then you keep it. If not, let it go. It might sound a bit silly, but the intuitive process works better than you might think. If you'd like to learn more, Kondo has a book detailing her practice in further detail. More often than not, a junk drawer is basically just constant source of stress. With just thirty minutes and some dedication, however, you can make your stressful drawer to something that’s actually useful. First, take everything out. Throw away anything you can’t or won’t use, like sauce packets, old mailers, or worn-out pencils. Next, sort everything into piles such as: tools, coupons, pens, change, etc. Consider moving these piles into more useful areas. If anything’s left-over, organize it into categories and put drawer inserts into your junk drawer. Inserts will help make your junk drawer a practical catch-all instead of a wasteland of stuff. A shed is very similar to a junk drawer, except the stuff you cram into it can be even more eclectic. When was the last time you visited your shed? If you can't remember, it's probably a good time to give it a look, clean it out, and organize. Approach your shed the same way you did your junk drawer. Like with the junk drawer, buying or making your own organizational helpers might really help with your decluttering. You could put up some pegboard, make some wall-mounted hose organizers, or even invest in some new shelving. Everyone has things that they don’t want to get rid of, but also don’t want cluttering their home. Everyone has collections that have value but aren’t exactly pretty to look at. Everyone has stuff. 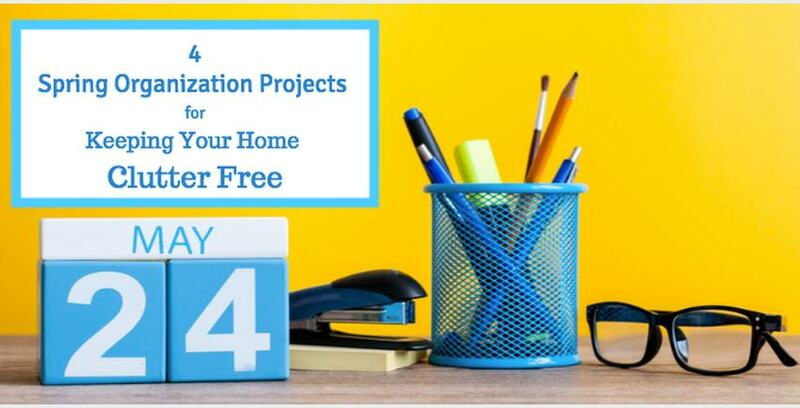 All the other projects we recommended are about organizing the stuff that’s staying in your home. This suggestion is about finding a new home for those things. A storage unit is the perfect solution for reducing clutter without throwing too much away. It gives you a chance to reorganize, re-evaluate, and safely store things you want to keep but don’t have room for. Make the most of the season of renewal by clearing your home and taking pride in the projects you accomplish. For everything else, there’s Storage Direct.